Trans­port from the cen­ter of an African coun­try to the port of des­ti­na­tion is no triv­ial task. For­tu­nate­ly for CAPLINQ, Gabon is a coun­try with many nat­ur­al resources, so some lev­el of infra­struc­ture has already been estab­lished. This is of sig­nif­i­cant impor­tance to the Food-Grade Native Tapi­o­ca Starch project in Gabon, Africa since con­struc­tion of this infra­struc­ture from scratch would make this project cost pro­hib­i­tive. 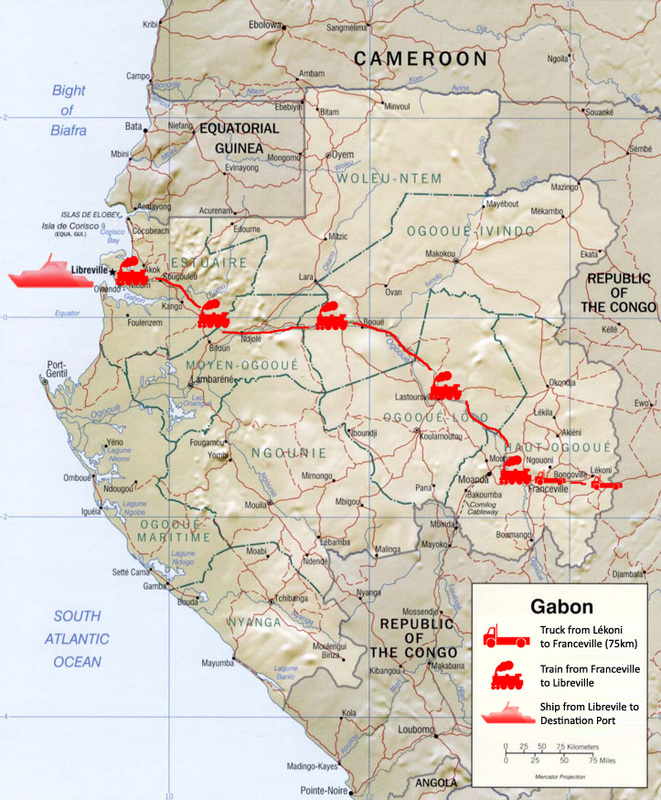 CAPLINQ and ANK Gabon have part­nered with an exist­ing pri­vate Man­ganese-extrac­tion com­pa­ny that has already expand­ed the exist­ing rail­way sys­tem from the cen­ter of Gabon to the port where the goods are loaded on the car­go ships. Sum­ma­riz­ing the trav­el route, the cas­sa­va roots are extract­ed in the field in Lekoni, Gabon. They are trans­port­ed with trac­tors to the fac­to­ry that is cen­tral­ly locat­ed with­in 15 kilo­me­ters of the fields where the roots are trans­formed into food-grade tapi­o­ca starch. From here, the native starch is loaded into conatin­ers and brought by truck to Franceville where they are loaded onto train cars. The train cov­ers the largest dis­tance, mov­ing the goods right to the port in Libre­ville where they are then loaded on the car­go ships and shipped to the cus­tomers’ des­ti­na­tion port.